Limited Time offer, 3 lbs. of our famous Wagyu Ground Beef Free! 3 lbs free with every $100 you spend, maximum 6 lbs. per order. Excludes discounted meat bundles. Ground Shipping averages $35 and will take 1-3 days to arrive. We ship our products frozen on dry ice or cold packs. If you need any assistance call 417-849-1227. Purebred Wagyu with the correct genetics and finished properly produce a more authentic product, If you have tried Wagyu before chances are it was only 50% Wagyu genetics. Why pay a premium for a product that is only half as good as it good be? The USDA allows cattle with only 50% Wagyu Genetics to be branded as "Wagyu Beef", Our Wagyu Beef is a minimum Purebred Wagyu Genetics this is rare to find in domestic Wagyu Beef. Most producers only have 50% Wagyu genetics and do not bother to tell you it is only half Wagyu. Only the finest restaurants and ranches offer this level of quality. If you take time to check you will find that most Wagyu you have tried or will be purchasing will be only 50% Wagyu. 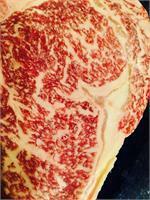 We have found that this 50% Wagyu Beef lacks important qualities Wagyu Cattle offer. Such as a higher unsaturated fat ratio, tenderness and marbling quality. We personally raise each Wagyu steer at the JB Kobe Farms for you at our family ranch- not a feedlot. We do not purchase any meat from other producers. Our Wagyu Cattle are pampered on pasture and fed a secret blend of all natural grains that maximizes the flavor, marbling, and tenderness of our Wagyu Cattle. If you are tired of commercial grocery store beef you will love Wagyu beef from our ranch. The Processed and aged at a locally owned and operated USDA inspected processing plant. Wagyu with the correct genetic markers are up to 3 times higher in Mono Unsaturated Fats, and also High in Oleic Acid. We breed our cattle to have this genetic marker. All items are vacuum packed and frozen. Products are shipped on dry ice and will arrive frozen or partially thawed. If you are ordering for the holidays please get your orders in as early as possible, you can email us at jbfarms@kobemidwest.com after you place your order if you want package to arrive on a specific date. If you have questions feel free to contact JB Kobe Farms at (417) 849-1227. High Quality Wagyu Kobe Style Beef.